Imagine you are working in a setting affected by a natural disaster, conflict, or both. How would you determine the number of liters of water per day beneficiaries need? How many calories of food per day? How many latrines for how many people? What level of malnutrition signals an emergency? Look no further than the Sphere Handbook, a set of minimum standards and indicators that represents the strong consensus of the international humanitarian community on these and other issues. The handbook is a useful tool for planning, carrying out, and evaluating humanitarian assistance programs. As of today, it is available in Kreyol. Please share with your Haitian counterparts. In the weeks to come, I’ll provide updates on recovery efforts in Haiti sector by sector. Why start with education? After an emergency or a natural disaster, schools provide an opportunity to protect children physically and psychologically. It re-establishes a sense of routine, stability, and above all, hope for a better future. Technical and vocational education will be critical for developing a new generation of skilled workers and leaders. 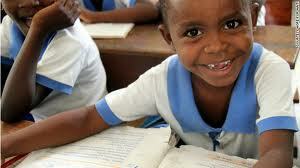 Without educational reform, Haiti’s recovery and long term development will be held back. The Haitian Education and Leadership Program (HELP), which provides merit and need based scholarships for Haiti’s top high school graduates, will hold its second annual fundraising event in Washington, DC on Friday, July 10th. The event will feature music, cocktails, Haitian food, and speeches from HELP alumni. If you’d like to be a part of this event, please register here by July 1st. Copied below is a recent IPS article on HELP's efforts to recruit talented students in rural areas and attached is an invite and fact sheet. If you are (very) interested in Haiti, consider joining Corbett's List, easily the most active Haiti listserv. The listserv carried an email today about Poto Mitan, an impressive online repository of educational resources in Kreyol - everything from poetry to proverbs to computer terminology. It could be a good resource for Haitian educators or for people who want to learn Kreyol. Links to several of the items featured on Poto Mitan are listed below.